The Eccles Institute for American Studies hosted a fascinating talk at the British Library on Monday evening. 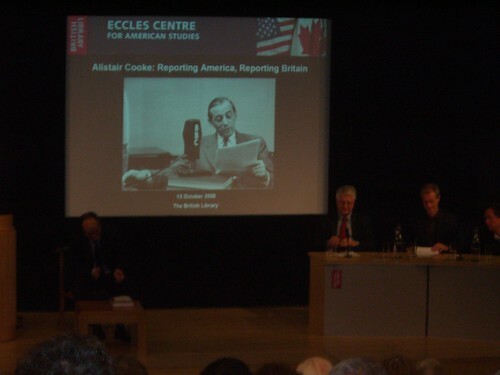 Entitled ‘Alistair Cooke: Reporting America, Reporting Britain’ and commemorating the centenary of the great journalist and broadcaster’s birth, the panel reflected on the differences and similarities in journalistic culture both sides of the Atlantic. The Guardian’s Martin Kettle recalled a conversation he’d had with Cooke that, in many ways summed up the theme of the evening: the USA is a foreign country and a correspondent forgets that their peril. Stephen Sackur from the BBC told how on 9/11 he found himself in Nicaragua. His epic car journey from the Mexican border to NYC over several days gave him a unique insight into a vast country and varied people totally bewildered: ‘why do they hate us?â€ The chap from Reuters (alas I didn’t note his name down) expressed his concerns that cost-cutting and unenlightened management would mean fewer and fewer foreign correspondents and decreased quality in news reporting. In further discussion, the value of instant reaction from journalists on blogs was questioned but the growing importance of bloggers and the contribution they make was acknowledged. Kettle suggested that Cooke wouldn’t have approved of blogging because it was so often discourteous. The importance of sport in Britain and America was agreed to be huge and the reasons behind the undeniable superiority of American magazines examined. The panel was unashamedly pro-American, praising her citizens for being optimistic and inventive and critical of Brits (and especially some sectors of the media) for being patronizing and negative. There was hope that the election of President Obama (sounds good, ehh?) would go some way to reinstate the USA as an intelligent, liberal power and force for good in the eyes of the world.